It’s the age old question for rock bands everywhere: how do you get jaded, hardened music critics and advertisers to listen to your jams when many (in fact, most) CDs and MP3s submitted will immediately be allocated to the circular file (a.k.a the trash can)? In a brilliant play to persuade the taste makers to take a listen, the German electronic music label Kontor Records utilized mobile technology and a whole lot of groove to promote one of their artist’s latest singles. In 2015 Electronic music artist Boris Dlougosch’s single arrived in offices as a vinyl album, which in itself gets high marks on the cool scale. But it gets better. The album arrived with its own 2-D cardboard player and instructions for downloading an app that allows the listener to play the album with their smartphone. 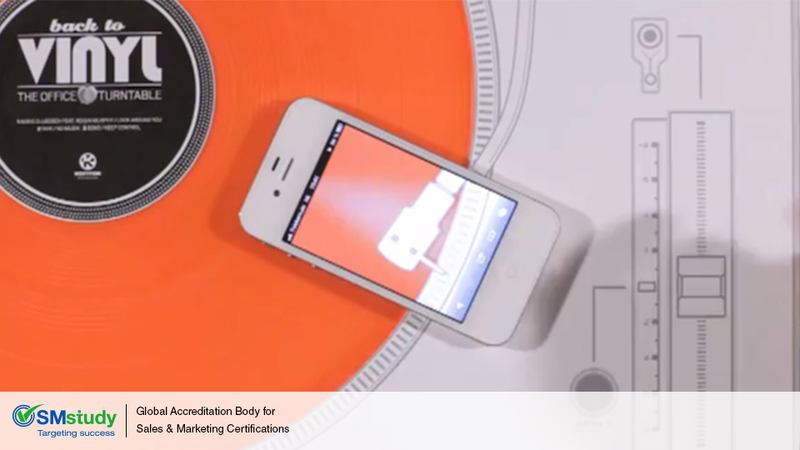 Yes, you read that correctly…the vinyl album is played with a smartphone! A virtual needle allows listeners to skip through the track just like on a real turntable. As the Office Turntable shows, mobile apps can be used in highly creative ways. But mobile apps of varying creativity levels and other personal devices are a large part of a company’s digital marketing strategy. Digital Marketing, book 2 in the SMstudy Guide® states that since an increasing percentage of consumers use the Internet on-the-go, having a mobile version of a website helps a business reach out to consumers across all devices connected to the Internet. In the case of Back to Vinyl: The Office Turntable marketing campaign, old school vinyl and new school technology come together to give a truly novel music experience that also allows for careful tracking on engagement. According to Kontor, of the 900 mailers sent out, they’ve had a 71 percent activation rate, which they claim is a 64 percent increase above their average. Sounds like they’re on a roll.